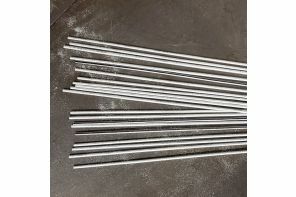 Very high strength, high temperature (715-735°F / 379-391°C) solder for casted Aluminum, Zamak, Diecast and White metals - Solid 10 rods + stainless Steel brush + instructions + 3 oz. Lunar Flux. 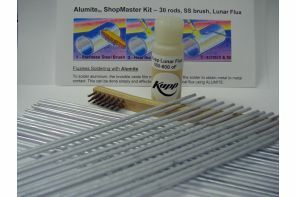 Very high strength, high temperature (715-735°F / 379-391°C) solder for casted Aluminum, Zamak, Diecast and White metals - Solid 20 rods + stainless Steel brush + instructions + 3 oz. Lunar Flux. Very high strength, high temperature (715-735°F / 379-391°C) solder for casted Aluminum, Zamak, Diecast and White metals - Solid 30 rods + stainless Steel brush + instructions + 3 oz. Lunar Flux. 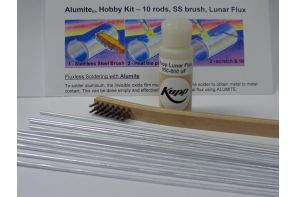 Alumite™ is the original high temperature fluxless soldering and brazing rod for the fabrication, maintenance, and repair of casted Aluminum alloys, Zinc alloys, Zamak alloys, Pot Metal, and White Metal. Alumite™ has been used and endorsed by leading cast Aluminum, Diecast, and White Metal manufacturers for over 75 years. Alumite™ solder repairs Aluminum boats, engine heads, motor housings, power mowers, farm and dairy equipment, blocks and crankcases, vacuum cleaners, carburetors, gears and pumps, jigs and fixtures, dies and match plates, trophies and ornaments, models and patterns, antique car parts, windows and doors, and Aluminum boat propellers. TIP: If high strength is not required, (EX: decorative applications) it may be best to avoid additional heat. This is especially true for thin or sheet parts, as the different metals will deform when heated unevenly. When high strength is not required, consider KappAloy15™. 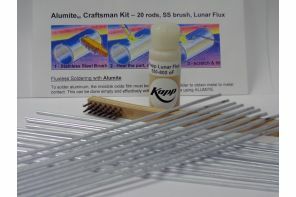 Kapp Lunar™ Flux has been designed specifically for soldering casted Aluminum, Diecast, Zamak, White Metal, and Pot Metal using Alumite™ solder. Residue is electrically conductive and slightly corrosive. Any flux residue should be removed with warm water or alcohol and a clean rag. Lunar™ flux will char at temperatures above 800°F. DO NOT OVERHEAT FLUX.